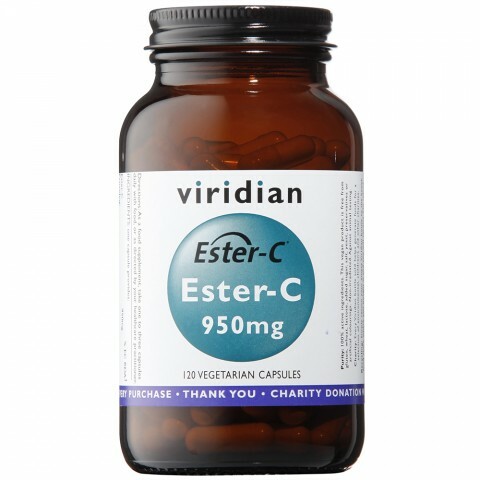 Highly effective, highly absorbable patented form of vitamin C. Ester-C™ is a neutral pH presentation of vitamin C, where the vitamin C is buffered to make it gentler on the stomach particularly where larger amounts are consumed. Vitamin C plays an essential role in numerous areas of human health. Vitamin C contributes to normal collagen formation for the normal function of bones, cartilage, skin, gums and teeth. Vitamin C also enhances iron absorption and the normal energy-yielding metabolism. Vitamin C aids in the maintenance of the immune system including during and after intense physical exercise. Vitamin C contributes to normal psychological function, the functioning of the nervous system and contributes to the protection of cells from oxidative stress. This 'oxidative stress' appears to be a major factor in many human diseases. Presented in a base of alfalfa, spirulina and bilberry. Ester-C 950mg, providing:ascorbic acid 750mg/calcium 85.5mg/threonic acid 9.5mg.